Urticaria is the clinical name for the common allergic response known as hives. This condition can happen in individuals of any age and can be irritating and sometimes even debilitating. Fortunately, there are quite a few treatment options and new treatments are being discovered every day. The condition is characterized by red or white raised welts that can form anywhere on the body and are generally quite itchy. Often, hives are accompanied by areas of swelling around the eyes, lips and throat known as angioedema. When this type of swelling occurs in the throat, it can lead to life threatening impairment of breathing or anaphylaxis. In most cases, hives tend to go way within 30 minutes to 36 hours after they first develop. What causes hives to appear on the skin? 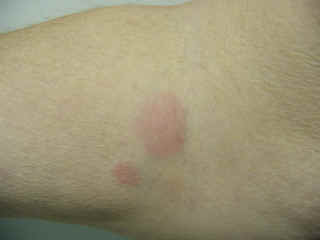 • Hives can be caused by something taken internally, most often a medicine such as penicillin or aspirin. • Sometimes foods cause hives; shellfish and strawberries are well-known examples. 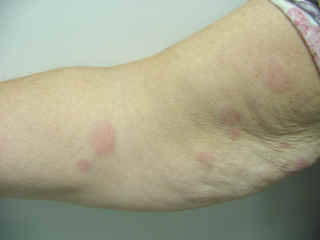 • Hives are also sometimes caused by infection. • Stress, heat and alcohol consumption can also cause hive breakouts. Because there are so many potential triggers, we often don’t know the cause unless it happens immediately following some kind of event. For example some people break out in hives after a few sips of beer. And the question that many people ask: Are hives contagious? No they are not. They only affect the individual and can not be passed to another person through contact. How do you treat hives breakouts? When treating hives, we try to find their cause. Medicine is usually prescribed to control the rash and itching if it does not go away in a short period of time. Injections of epinephrine (Adrenalin) may be used for treating severe cases of hives. Sometimes epinephrine-like medicines taken by mouth are used in combination with antihistamines. Natural treatments such as OxyHives may be effective but that might not work for every case. If these drugs don’t provide treatment for hives, it’s likely that cortisone will. Hives usually improve within 24 hours of starting a medication. Medicines applied to your skin such as lotions, creams, and sprays likely won’t help too much. When the hives have cleared up, continue taking the medicine for 2 days. Once you’ve been free of the hives for 2 days, gradually decrease your medication over the next 7-8 days. Cooling the skin often relieves severe itching. A cold shower is the simplest way. Since heat worsens itching, avoid overheating and hot baths. While antihistamines and other medications can help to relieve symptoms, there are also natural substances that are known to relieve inflammation and stimulate immune system function and these can bring relief to individuals suffering from hives. These substances include: Aloe vera, Curcumin, Echinacea, Ginger and Green Tea. A recent study has also found that a once a month injection of the common asthma medication omalizumab has proven effective at controlling symptoms in teens and adults affected with chronic hives. This is a real ray of hope as this medication does not carry the same kind of debilitating side effects as most antihistamines.